5. Publication of Casebook "Roth Orthodontics"
The Roth Study Club Japan (RSCJ) is an organization comprising clinical orthodontists who have incorporated into their practices the Roth philosophy, an orthodontic diagnosis and treatment system established by Dr. Ronald Roth based on 40 years of his clinical experience and research activities. The Roth philosophy allows objective evaluation and diagnosis of jaw position and functional occlusion, an overlooked area in conventional orthodontic diagnosis, and execution of treatment based on the diagnostic information. It enables the orthodontist to improve diagnostic accuracy and predictability of treatment. This provides patients with higher quality results. Drs. Ronald Roth and Robert Williams gave courses and lectures to teach the philosophy in many parts of the world for 20 years. Their two-year comprehensive orthodontic course was inaugurated in Japan in 1990 under the leadership of Dr. Kazumi Ikeda. Graduates of these courses gathered in 1996 to establish the RSCJ as a forum for information exchange and continuing education to facilitate the implementation of the Roth philosophy in their practices. Since then, the study club has held annual meetings to improve their knowledge and skills of treatment through case presentations by all participants. The RSCJ members have also been active in exchanging information with orthodontists who share the same philosophy through the annual RWISO meeting. 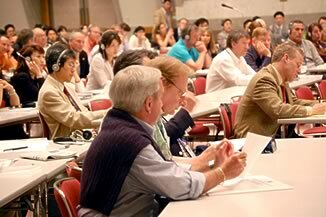 The photograph below shows a scene from the 2007 RWISO meeting held at the Kyoto International Conference Hall. The RSCJ is taking initiative as a driving force for advancement of orthodontics throughout the world, without being complacent with top-quality orthodontics within Japan. Roth Study Club Japan All Rights Reserved.